LAWRENCE — Perhaps the bias against left-handers dates back much further than we thought. By examining striations on teeth of a Homo habilis fossil, a new discovery led by a University of Kansas researcher has found the earliest evidence for right-handedness in the fossil record dating back 1.8 million years. "We think that tells us something further about lateralization of the brain," said David Frayer, a KU professor emeritus of anthropology and the lead author of the study. "We already know that Homo habilis had brain lateralization and was more like us than like apes. This extends it to handedness, which is key." The findings were published online this week in the prestigious Journal of Human Evolution. 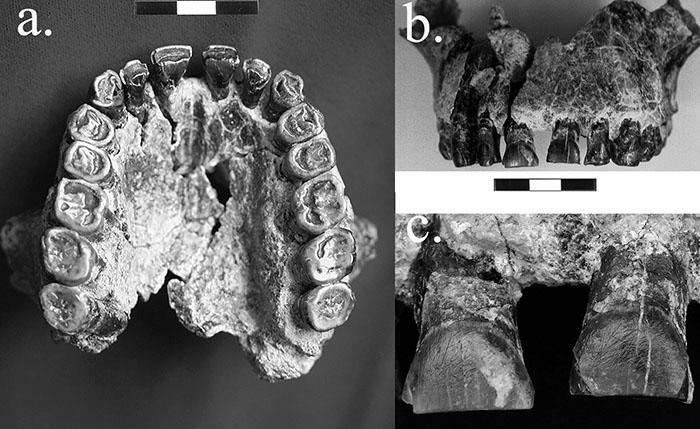 The researchers made the discovery after analyzing small cut marks, or labial striations, which are the lip side of the anterior teeth in an intact upper jaw fossil, known as OH-65, found in a stream channel of the Olduvai Gorge in Tanzania. Frayer said among the network of deep striations found only on the lip face of the upper front teeth most cut marks veered from left down to the right. Analysis of the marks makes it likely they came from when OH-65 used a tool with its right hand to cut food it was holding in its mouth while pulling with the left hand. The scratches can be seen with the naked eye, but a microscope was used to determine their alignment and to quantify their angulation. "Experimental work has shown these scratches were most likely produced when a stone tool was used to process material gripped between the anterior teeth and the tool occasionally struck the labial face leaving a permanent mark on the tooth's surface," Frayer said. Based on the direction of the marks, it's evident the Homo habilis was right-handed. It's a sample of one, but because this is the first potential evidence of a dominant handed pre-Neanderthal, Frayer said, the study could lead to a search for the marks in other early Homo fossils. "Handedness and language are controlled by different genetic systems, but there is a weak relationship between the two because both functions originate on the left side of the brain," he said. "One specimen does not make an incontrovertible case, but as more research is done and more discoveries are made, we predict that right-handedness, cortical reorganization and language capacity will be shown to be important components in the origin of our genus." Multiple lines of research point to the likelihood that brain reorganization, the use of tools and use of a dominant hand occurred early in the human lineage. Today, researchers estimate that 90 percent of humans are right-handed, and this differs from apes which are closer to a 50-50 ratio. Until now, no one looked for directionality of striations in the earliest specimens representing our evolutionary lineage. "We think we have the evidence for brain lateralization, handedness and possibly language, so maybe it all fits together in one picture," Frayer said. Co-authors of the study are Ronald J. Clarke, Evolutionary Studies Institute at the University of Witwatersrand, Johannesburg, South Africa; Ivana Fiore and Luca Bondioli, Polo Museale del Lazio, Museo Nazionale Preistorico Etnografico "L. Pigorini, Rome, Italy; Robert J. Blumenschine, Paleontological Scientific Trust, Johannesburg, South Africa, Alejandro Pérez-Pérez, Laura M. Martinez and Ferran Estebaranz, Department on Animal Biology, University of Barcelona, Barcelona, Spain and Ralph Holloway, Department of Anthropology, Columbia University, New York.